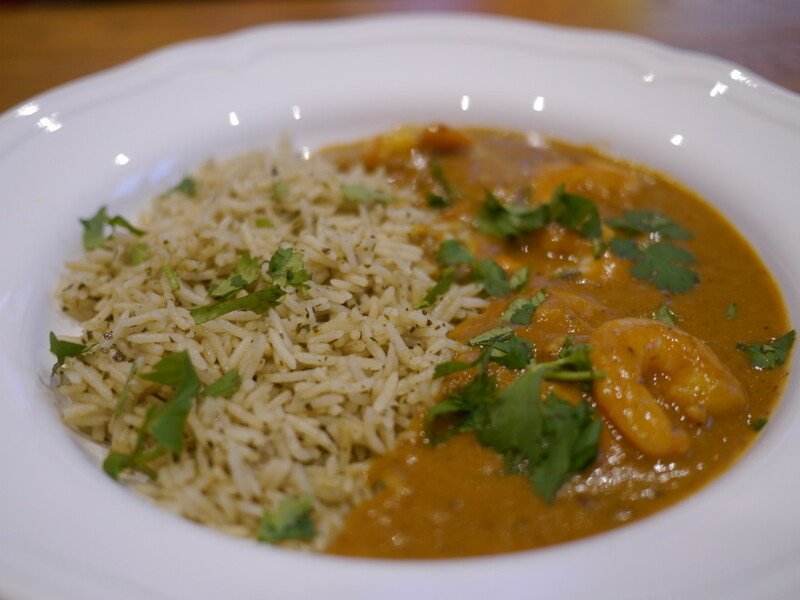 I LOVE a spicy prawn curry – it is my weakness and one of my favourite meals in the world. My Maille Colombo Prawn Curry uses traditional flavours enhanced with a generous dose of Maille White Wine, Coconut and Colombo Spices mustard simmered to velvety perfection in creamy coconut milk. The result was brilliant and here’s the recipe if you would like to have a go. I served the curry over Tilda pre-packaged Lime & Coriander Rice (available at your local supermarket) but of course, white basmati will do just fine. The curry didn’t last long and was devoured within minutes. This recipe serves 2-3 who like a lot of gravy. Double the prawns if you have more mouths to feed. On medium heat, fry the hard spices (cinnamon, cloves, cardamom seeds, dry red chillies, peppercorn) along with ginger garlic in a bit of oil for a minute until the aromas release. Add the chopped onions and cook until brown. Stir in the chopped tomatoes (adding a little water if the mixture is too dry), turmeric and red chilli powder. Cook for 5 minutes. Add in 200ml of coconut milk and stir well. Take the pan off the heat and let cool for a few minutes. When cooled, blend the mixture in a food processor to create a smooth, creamy paste. Scoop the paste back into the pan. Add in the rest of the coconut milk, Maille mustard, salt and sugar and stir well. Simmer for 5 mins on low heat to produce a creamy, velvety gravy. Stir in the cooked prawns and adjust seasoning (if required). Garnish with chopped coriander and serve with hot basmati rice. I can’t wait to enjoy this delicious prawn curry again and am definitely stocking up on the Maille Colombo Spices mustard. Congratulations Reema, I read your blogs with great interest as they are very informative! Keep it up and look forward to see many more this year. All the best! Thank you for always reading, liking and commenting!!! Glad you enjoy it and can’t wait to see what’s in store for the next year! Congrats :-)! WOOOHOOO! And this curry dish sounds YUMMY. OMG! Mmmm.